Hanson chooses to live - alone - in the precinct that he patrols; he, unlike the rest of the white officers, takes seriously his duty to serve and protect the black community of East Oakland. 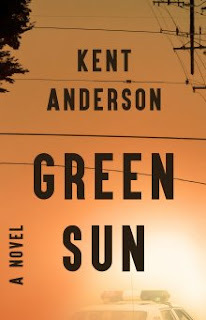 Kent Anderson’s first novel in more than twenty years sparkles darkly, like California iron sands shimmering under the baking heat of a midsummer sun; beautiful yet dangerously hot to the touch. It’s mesmerizing - violent and thought-provoking, full of flashes of brutality yet gorgeously written. Captivating and brilliant. Green Sun belatedly continues the story of Hanson, who first came to the page in Anderson's debut novel, Sympathy for the Devil, way back in 1987. In that book Hanson was a young man, a poetry-loving college student turned Green Beret who discovers the savagery within himself as he scrabbles to survive the horrors of the Vietnam War. Perhaps surviving hell, too well. Anderson, who himself was a special forces soldier in that terrible war, earning two Bronze Stars, delivered a thunderclap of a war book, called an all-time classic in some circles, laying bare the seductive violence of war. Ten years later, Hanson returned in Anderson's second novel, Night Dogs, this time as a police officer in Portland, Oregon (another reflection of Anderson's own real-life resume). Similarly authentic, chilling, and powerful, that book juxtaposed war-time violence with violence in the inner city. Two books, two classics, a decade apart. And then two decades passed. In Green Sun, Hanson is now approaching forty years old, but after a stint teaching at college, he's signed up for the Oakland police academy, looking to get back on the beat. He needs an outlet for the darkness and violence flooding his veins, while bringing a completely different mindset to the job than the young recruits. Despite his brutal past, Hanson sees himself as a social worker with a gun; he's someone willing to actually be a 'peace officer', as police were originally meant to be. The Oakland streets of the early 1980s can resemble a war zone, and Hanson has colleagues as well as criminals gunning for him. He just wants to survive, get his months in, and move on. Anderson tells Hanson's tale as a series of vignettes, slices of life for an unusual street cop. There’s not so much a central storyline to Green Sun as there is an accumulation of experiences that give us a startlingly raw look at the realities of cop life at that time and place. There’s a gritty authenticity rising to the surface among the spare beauty of Anderson’s prose. Hanson is an unusual, unforgettable character that’s easy to follow even as events and choices get sharp. A searing insight into life on the streets, from a master storyteller.